Four years after the Reserve Officers’ Training Corps’ reinstatement on campus, the challenges of reuniting two long separated institutional and bureaucratic giants—Harvard University and the United States military—remain. I t’s a frigid night in mid-February, and for those who have braved the growing piles of snow outside, the Gordon Indoor Track provides a warm, if crowded, refuge. Various teams jostle for practice space, mostly ignoring the gray-clad group of students on the infield. Ten minutes ago, the track echoed with the shouts of cheerleading practice. Now, there’s a markedly different tone in the air, as Harvard students in the Army Reserve Officers’ Training Corps take to the track. “Off to battle we will go, to live or die, hell I don’t know,” yells James J. W. Clarke ’16 as he circles the track. Beside him, a group of cadets stride in time, repeating the traditional lyrics. This is a cadence, a rhythmic call-and-response drill the cadets use to practice marching. In formation along the outside edge of the track, they’re careful to leave room for the ultimate frisbee team. It’s 9:30 p.m. on a Thursday, almost at the end of an hour-long physical training session. The cadets wear matching workout gear emblazoned with “ARMY,” hair either closely shorn or pulled back into tight ponytails. “From a big bird in the sky, all will jump and some will die,” Clarke continues as the cadets round the track. Somewhere between solemn and facetious, the lyrics allude to an intensely real future that the rest of the workout—push-ups, sprints, burpees, and mountain-climbers—has made easy to ignore. For now, Clarke and the rest are student-soldiers, existing in the sometimes chaotic space between p-sets and platoons, not to mention the gap between the formidable and not always aligned institutions of Harvard and the military. But someday soon, if they complete the program, they’ll take on new roles as commissioned officers. Following the repeal of the military’s “Don’t Ask, Don’t Tell” policy towards gay and lesbian service members, Harvard officially recognized both Navy ROTC in 2011 and Army ROTC in 2012 to celebratory fanfare. But for students in the program, the merit of reinstatement was largely symbolic. Besides a few benefits like Harvard-funded Zipcars to and from physical training as well as largely unused office spaces in the Student Organization Center at Hilles, the program is largely unchanged on a logistical level. There’s a sense among students in ROTC, alumni of the program, and veterans at Harvard’s graduate schools that the University could be doing more to accommodate students and to grow ROTC’s once-expansive presence on campus. The challenges of reuniting two long separated institutional and bureaucratic giants—Harvard University and the United States military—remain. On April 8, 1917, the Boston Globe published an article titled “Harvard Almost A War College.” It wasn’t a sensationalist headline: Students were flocking to Cambridge to join the newly established undergraduate military program. Nearly 1,000 young men from Harvard and other Boston-area schools trained for service on Harvard’s campus, marching and preparing for war in Harvard Stadium. Archival photographs show students learning to bayonet on the football field. One of the first schools in the United States to host an ROTC program, military preparation was nothing new to Harvard. Its students had been joining the military in conflicts ranging from the Revolutionary War to the Civil War, now commemorated by the likes of Memorial Hall and Soldiers Field. Besides the United States Military Academy and the United States Naval Academy, Harvard University, with 18 recipients, has graduated more Medal of Honor winners than any other institution of higher education. 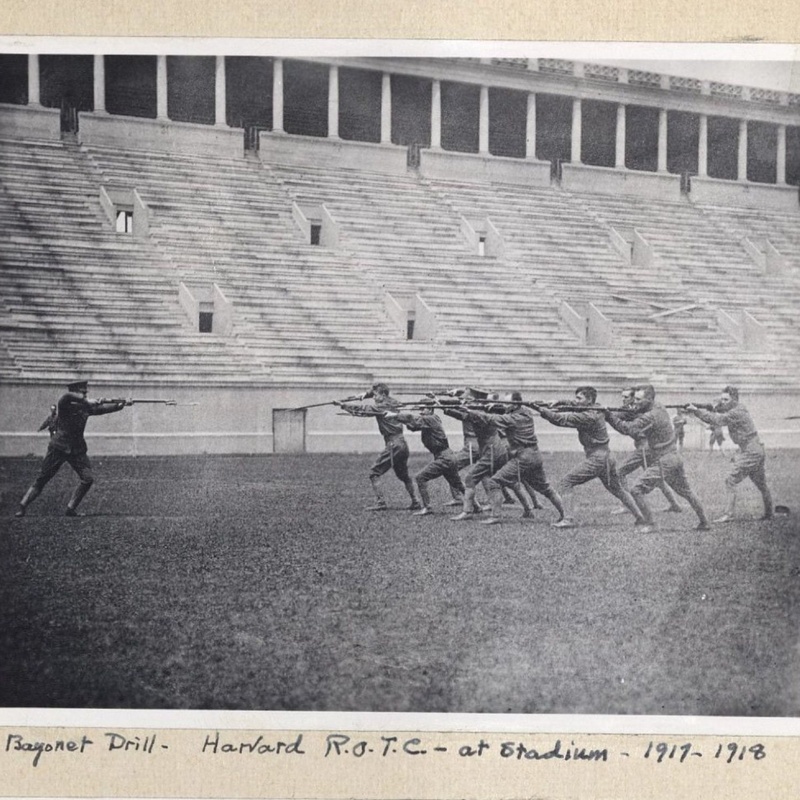 At left, students practice a bayonet drill at Harvard Stadium in 1917 or 1918, according to an annotation on the photograph; courtesy of Harvard University Archives HUPSF R.O.T.C. (12). 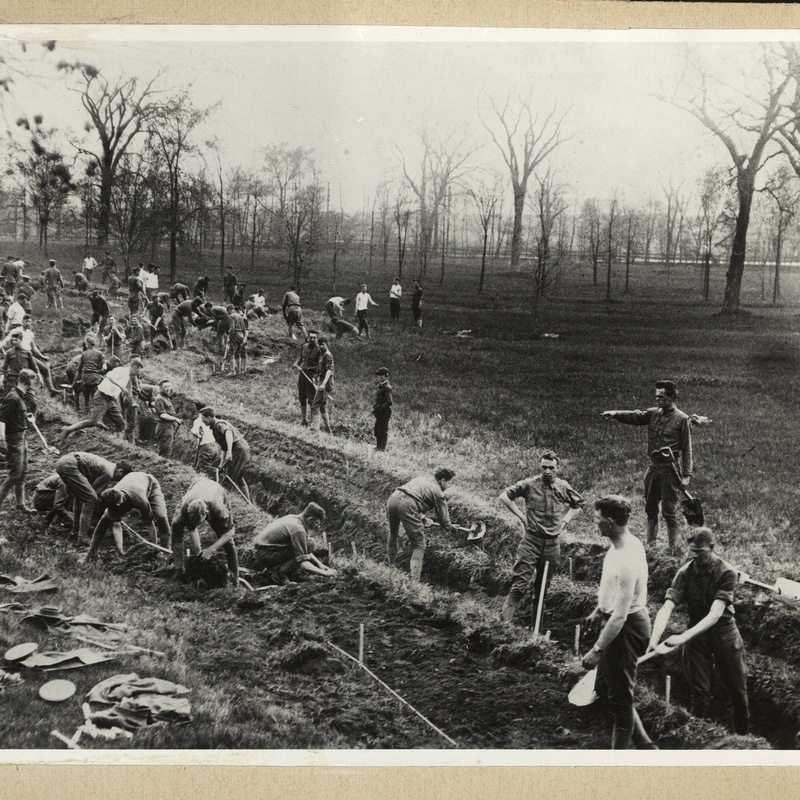 At right, also in 1917 or 1918, ROTC affiliates dig ditches at Fresh Pond; courtesy of Harvard University Archives HUPSF R.O.T.C. (18). Still, Harvard’s relationship with ROTC, and, by extension, the military, has fluctuated from near-unity to total disengagement. It was 1969, the peak of student and faculty backlash against the Vietnam War and its most visible on-campus symbol: the ROTC program. One night in April of that year, more than 300 students swarmed the home of then-University President Nathan M. Pusey ’28 and tacked a list of demands to his door, the first of which was to abolish the presence of ROTC on Harvard’s campus. The next day, hundreds of students occupied University Hall, carrying James E. Thomas, who was an adviser to freshmen at the time, out on their shoulders. They maintained the same list of demands: ROTC had to go, and, the following morning, they engaged in a confrontation with the police. According to Crimson reporting at the time, 75 people were injured and four people—including a police officer—were hospitalized. Louis Menand, now an English professor, remembers the scene well. A high school student at the time, Menand traveled into Cambridge from the suburbs where he lived to witness the organized protests. He brought along a video camera. That same year, the Faculty of Arts and Sciences voted to relegate ROTC to the status of an extracurricular and strip it of its previous academic standing—no longer would Harvard host Military Science professors—and all ROTC programming was phased out over the next couple of years. Once a hub of military service, Harvard’s relationship with the armed forces was effectively terminated. Harvard students could not even cross-register for MIT ROTC courses again until 1976, when the University decided to provide funding for and allow students to participate in ROTC activities at MIT. While 1969 is perhaps the most dramatic instance of campus uproar against the military in Harvard’s history, it would not be the only time the relationship, however small, was called into question. In the 1990s, students again protested Harvard’s relationship with ROTC. The activists, called the Anti-ROTC Action Committee, criticized the military’s policy toward gay and lesbian service members, which at the time barred openly gay and lesbian members from serving. In 1995, the University cut all remaining financial ties with the program, instead organizing an alumni trust fund, Friends of Harvard ROTC, to cover the administrative costs for hosting the program at MIT—roughly $150,000 per year. 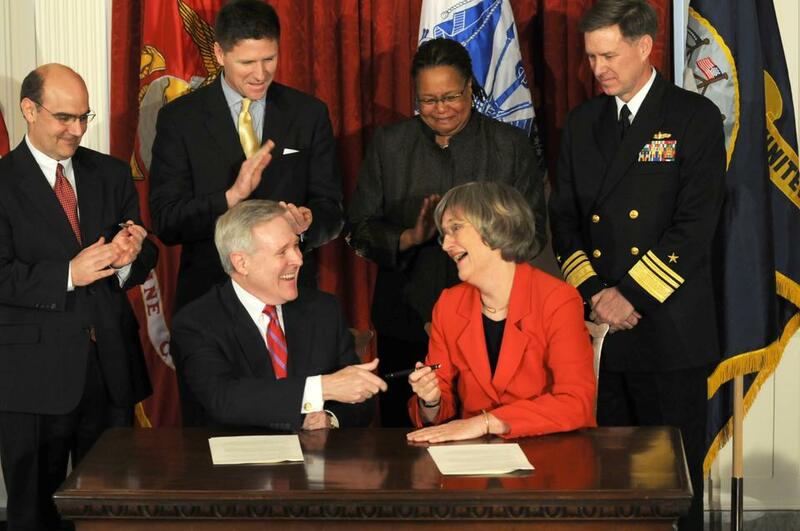 Navy Secretary Ray E. Mabus (seated, left) and Harvard University President Drew G. Faust (seated, right) signed an agreement in March 2011 to re-establish Naval ROTC at Harvard after nearly 40 years of absence due to Harvard's non-discrimination policy. It was a situation Lawrence H. Summers, the next president of the University, says he hoped to change. The steps he took—notably, attending the ceremonies in which students are commissioned into military service—set the groundwork for current University President Drew G. Faust’s eventual decision to welcome back the Army and Navy programs. It was a symbolic gesture that students in and alumni of the program praise as a long awaited reconciliation. In 2013, Faust received the Navy’s highest civilian honor for bringing Naval ROTC back to campus and repairing, if only nominally, Harvard’s long strained relationship with the military. For students in the program, many days start hours before sunrise. Carolyn F. Pushaw ’16, who’s enrolled in NROTC and hopes to one day fly helicopters for the Marines, describes her weekly schedule: Two hour-long group physical training session at Boston University, two independent work-out times, a weekly “leadership lab,” naval science coursework, and staff meetings for leading the other midshipmen. 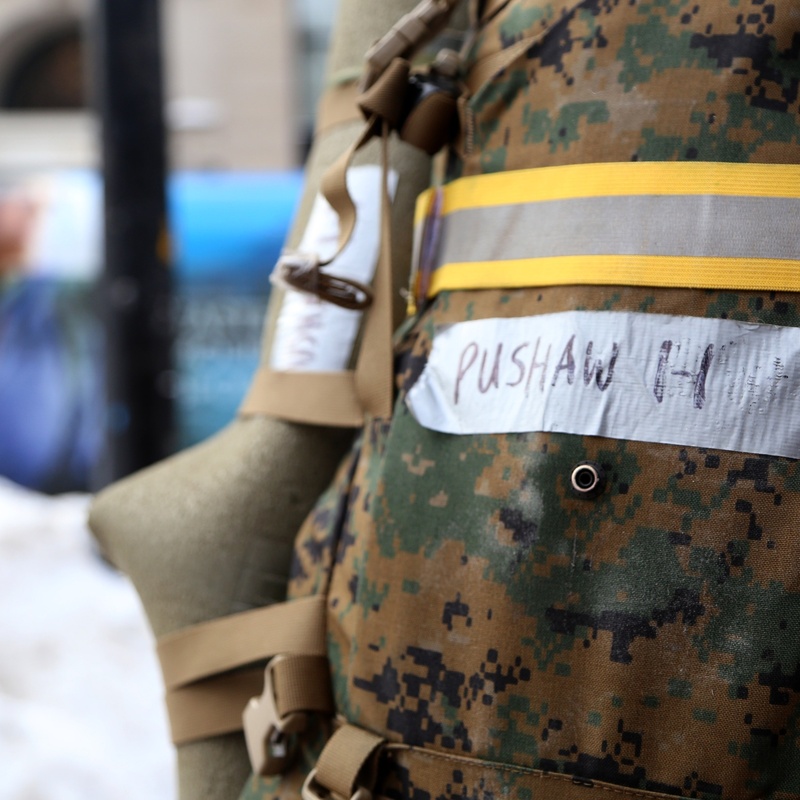 Despite official recognition and a change in the tenor of Harvard’s relationship with the military, Pushaw’s schedule, as a Navy midshipman, takes place entirely off Harvard’s campus. Pushaw, like all other cadets interviewed in this story, says she speaks for only herself and does not represent the views of the military. “Those are all from 0600—from 6 a.m. to 7 a.m.,” she says about the physical training sessions, a few hours after that morning’s workout. She stops herself as she uses the 24-hour time standard typical of the military. In many ways, this split second adjustment—from the military standard to the civilian one—captures the ROTC experience. As full-time students and military officers-to-be, Harvard ROTC participants must navigate two starkly different and historically divergent institutions. Everything from post-graduate plans—consulting vs. combat, piloting vs. programming—to the daily routine makes the ROTC experience a singular one, and the students in the program must transition between and blend the two. In short, they make it work. Carolyn F. Pushaw '16 decided she wanted to join the military when she was a child. Pushaw wears combat boots and a sorority sweatshirt to an interview in the Leverett dining hall. She says she’s wanted to join the military since she was young; she participated in a program called Sea Cadets at Malibu High School and was sold. Decision time came during her senior year, when, as many students must, she had to choose where to attend college: the United States Naval Academy or Harvard. She doesn’t regret her decision. “It’s like Miley Cyrus: best of both worlds,” Pushaw says, half-joking, of her decision to come to Harvard. The experience of a Harvard student enrolled in ROTC starts to diverge into these two worlds early on. In fact, Pushaw says her first week of college proved far different from that of her peers. Training time isn’t the only way the ROTC program shapes a student’s college experience. Members of the program say they are held to a different standard than a typical college student, a fact reinforced by Lt. Nathan Stempel, a naval engineering and naval weapons systems professor and adviser at the NROTC program at MIT (who also says his views represent his own and not those of the military). According to Stempel, if an underage ROTC student were caught drinking alcohol, his or her military career would be in jeopardy. They also have additional course requirements—students take roughly one military science course per semester, and Navy midshipmen must take coursework in calculus, physics, and military affairs. Indeed, for some students, a combination of the time commitment, the restrictions, and the promise of military service results in an early end to their ROTC, but not necessarily military, careers. Pushaw says that in her entering class, there were eight midshipmen in the NROTC program. Today, there are four. While scheduling and restrictions certainly distinguish daily life for cadets and midshipmen—it’s unlikely other student groups spend one weekend every semester doing tactical training at Fort Devens in central Massachusetts—students say differences extend beyond use of time or choice of concentration. Cadets and midshipmen emphasize that athletes also start their mornings early or train when everyone else takes a vacation, and that the real substance of their commitment is not just an allocation of hours in the day. The stakes become clear at physical training sessions, when Marine-option midshipmen are chastised for taking a breather. It’s a reminder that these students aren’t just suiting up a couple of days a week to wear boots and camouflage; many have contractually committed to a term of service in an institution that few Harvard students decide to join, to engage with “the enemy,” whomever that might be. 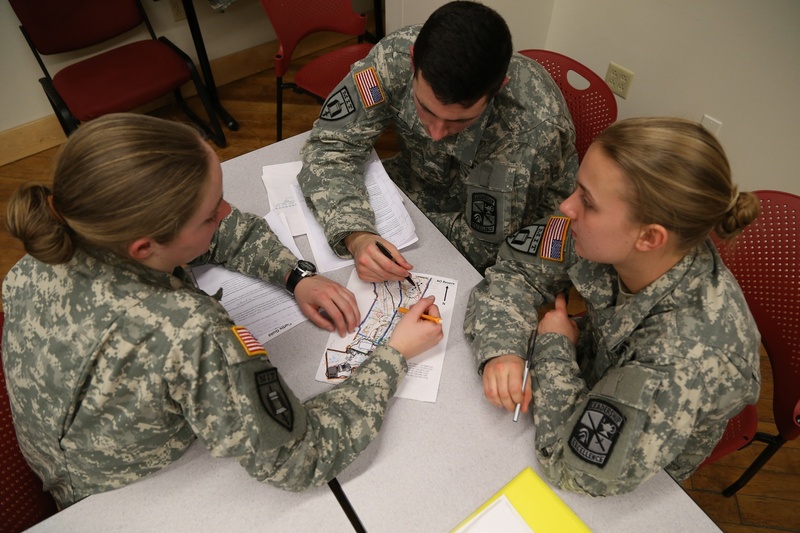 Charley M. Falletta ’16, Lucy F. Perkins, and James J. W. Clarke ’16 discuss tactics during Army ROTC’s weekly leadership lab on Wednesday, Feb. 18. “So whatever we’re building on now is very, very, very relevant to what we’re going to be doing immediately the day we graduate, which I think is different from other students here,” she says. Harvard’s ROTC cadets and midshipmen don’t just stand out on campus, but also have a unique place in the military. Ten out of 24 participants in Harvard’s ROTC program are female (one is a graduate student)—just over 40 percent—an unusually large number of women in a mostly-male institution. And, like many graduates, they will be subject to the same jokes and jabs the Harvard brand name brings; Pushaw recalls being dubbed “Harvard” at a nationwide summer training session. Dean of Freshmen Thomas A. Dingman '67 eats breakfast each semester with freshmen in ROTC. “That’s what it’s all about...you’re there for your buddies,” Falletta says. For Falletta, co-president of the Harvard ROTC Association, an undergraduate club for students in the program, the workout on the track is just another step in a journey that started when she was in second grade. Though her parents initially resisted her decision to commission, Falletta says she would make the choice again, despite the difficulties of balancing a Harvard workload with ROTC commitments. Following the reinstatement of the program in 2011, Harvard has made some efforts to ease that challenge, like providing transportation for students to get to early morning physical training and granting the program office spaces at the SOCH. But for Falletta, these are only first steps—and waiting for change in and between the institutions can be frustrating. At times, she’s felt that the Harvard administration is “at best, indifferent” to ROTC. Cadet Charley M. Falletta '16 says that her comments represent only herself, not the views of the military. “Is that really how you treat ROTC? I don’t know,” Falletta says. “I don’t think it was purposeful. I’m sure it was an oversight, but again, it’s at best indifferent. At worst, it’s something else.” Khurana has since apologized for having missed the meeting. Falletta isn’t the only cadet who has felt that there is a lack of administrative support for the program. Unlike the other two branches of ROTC, Air Force ROTC has yet to be officially recognized by Harvard’s administration, though they still receive some of the logistical support the recognized branches do, such as funded Zipcars. Nonetheless, Zander E. Farrow ’16 and Kira R. Headrick ’17, Harvard’s only Air Force ROTC cadets, say the lack of support is evident in their smaller numbers. Zander E. Farrow ’16 is one of two Air Force ROTC cadets at Harvard. “I think [official recognition] would be beneficial for us in the sense that it would bring awareness that the Air Force does exist at Harvard,” says Farrow, who leads HROTCA with Falletta. “I talk to a lot of people that are sophomores and juniors who would have been interested in the program had they been freshmen and known about it; they just weren’t aware that it was on campus.” And officially, it’s not. Air Force ROTC cadets have little to no interaction with Harvard’s administration, and no space at the SOCH. If enrollment is any indication, its lack of recognition may be having an impact. Re-recognizing the Air Force program is the first priority of the Advocates for Harvard ROTC, an alumni group that has long lobbied for more of an on-campus presence of the program. The above statistics—which include expected numbers for 2015, 2016, and 2017—were provided by ROTC cadet Charley M. Falletta '16 and are according to the Harvard Veteran's Organization. Headrick echoed the lack of clear reason for the continued disconnect. “It’s just something you kind of have to deal with,” she adds. While Associate Dean of the College Joan Rouse, who coordinates logistical aspects of Harvard ROTC with the commanders at MIT, says she isn’t aware of any projects currently underway to improve ROTC, administrators are open to cadet input on changes to the program. 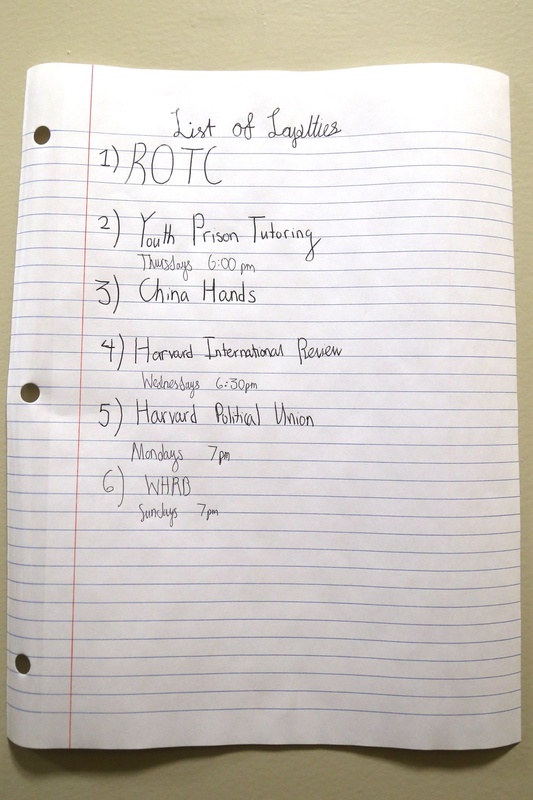 Nathan L. Williams ’18 keeps a priority list in his dorm room. When asked about ROTC, he explained, "What else would be more, more important?" “It’s funny because to normal students we’re the army, but to people in the army, we’re civilians; we’re just students. It’s like we’re in this middle world of who do we ask for help,” Williams says. A recent development is the Harvard Veteran’s Organization’s advising program, started last year, which pairs cadets and midshipmen with veterans affiliated with Harvard, often grad students who experience the same duality of purpose that ROTC participants share. “I really like the mentorship program here, because you can’t go to the college for help,” Williams says. “You could ask your PAF or your proctor, but they can’t really help you with items in the military.” Mentors from the HVO, on the other hand, have experience with both Harvard and military life. After recognition, much like in the past, it didn’t take long for protests to crop up again. Staged outside Loeb House, where Faust signed the initial NROTC agreement with the Secretary of the Navy in 2011, was a group of roughly 25 protesters. They held signs, chanted slogans, and staked out the event. They claimed that the University’s newly-forged relationship with the military still violated Harvard’s own policy of non-discrimination. Under military rules, transgender students could still not participate in ROTC, a fact that has drawn criticism from some students. 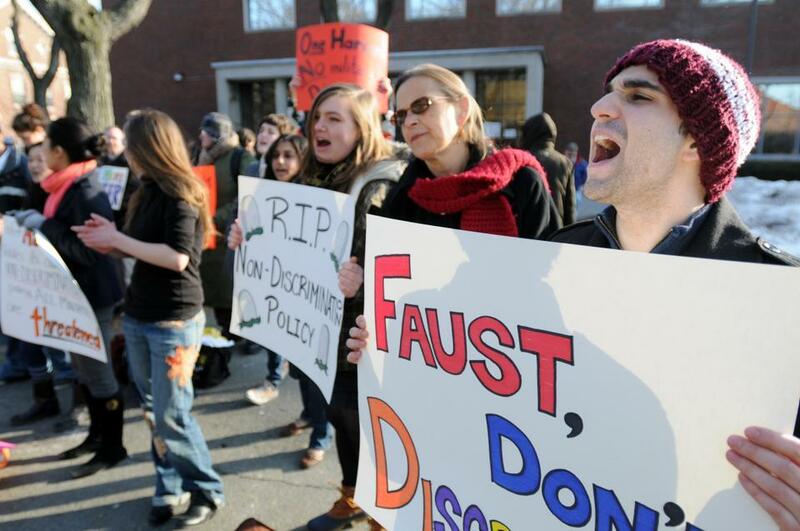 James R. Sares ’12 (right) and other demonstrators protested the reinstatement of ROTC at Harvard in March 2011 because, despite the repeal of "Don't Ask, Don't Tell," the military does not allow trans-identified or intersex individuals to serve. “When I personally found out about [Harvard recognizing ROTC] I was kind of hurt by that fact,” says the current president of Trans Task Force, a BGLTQ-identified junior who was granted anonymity by The Crimson because the student feared facing discrimination from future employers. Former Trans Task Force treasurer and former co-chair of the Harvard Queer Students and Allies W. Powell Eddins ’16 suggests that change should come in the form of pressuring the military to alter its policies rather than pressuring Harvard to cut ROTC. “I think [the military is] a hard place for anyone, regardless of sexuality, who is a little bit gender nonconforming,” Eddins says. Eddins points out that, through extensive scholarships, ROTC provides a route to education and military careers for students who might not otherwise be able to afford it. Some students in ROTC say that, in their time, they have not encountered criticisms of the program’s presence on the basis that it’s discriminatory. For the most part, they say that peers support their commitment, and University administrators are prepared to justify ROTC’s presence at Harvard. While Faust suggests it is the military’s role to address these policy issues, others in the Harvard administration believe it’s the University’s responsibility to keep the dialogue open and try to change policy, while also supporting the students in the program. Influencing policy concerning transgender service members isn’t the only way Harvard could affect the military, some say. Students in the program, members of the HVO, University administrators, and the officers who run the ROTC program argue that more Harvard students in the military would benefit both the quality of military operations and the University’s representation in leadership positions. They say that Harvard and the military have more to offer each other than what might be immediately apparent. 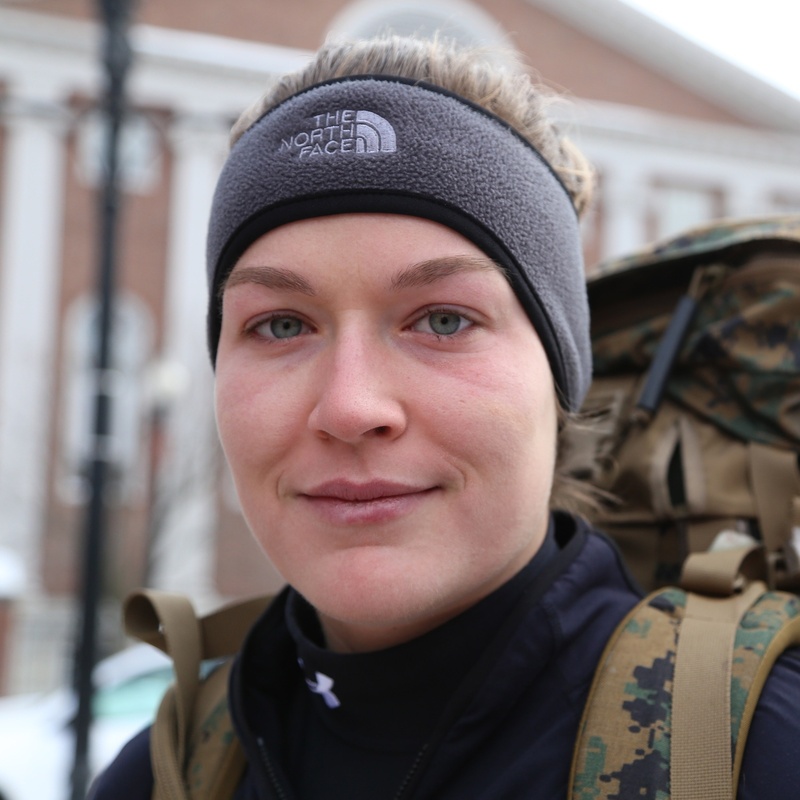 "I don't think that Harvard can take away the ROTC program because it's not inclusive. I think the military needs to be a more inclusive place," W. Powell Eddins '16 says. “We both want to grow leaders, critical thinkers, and people that have a call to serve their government. It’s more or less the same mission, so I think we can move forward together and be mutually beneficial, especially with the history Harvard has,” says Sean McDonough, a recruiting and scholarship officer for the Army ROTC unit at MIT. McDonough says his comments represent only his own views and not those of the military. And, many involved in the program—both on the student and administrative side—highlight that the military has always been a part of Harvard’s fabric. The protests, they say, were more concerned with the symbolism of the military’s presence on campus, not the individual students enrolled in the program. With recognition, there’s the hope that that will change. For most Harvard students, Sebastian R. Saldivar ’15 says, four years at Harvard can be a good time to try out interests, get exposed to different ideas and ways of thinking, and test out possible career paths—“not that you’ll necessarily know what you want to do when you graduate,” he adds. For Saldivar, a midshipman about to receive his commission, things work a bit differently. On Thursday, he will undergo a roughly three-hour interview in which he’ll be asked to solve physics and calculus problems—calculating volumes and trajectories of randomly selected objects on the fly—as well as discuss the structure and function of various aspects of nuclear-powered submarines. Later he’ll interview with a four-star Admiral, and at the end of the process, Saldivar will find out whether he’ll spend the next four years on a surface ship or, as he hopes, immediately begin year-long top-secret training for work on a nuclear submarine. “They do some of the same types of things in consulting interviews,” Saldivar jokes. 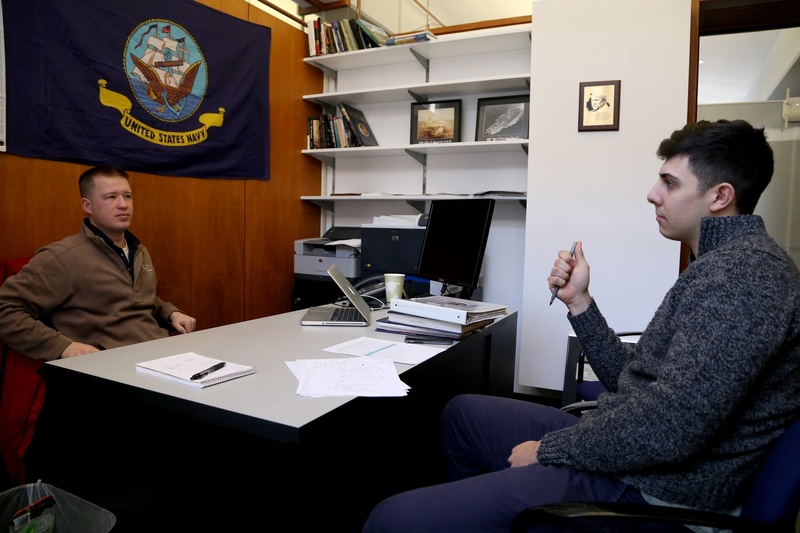 Lt. Nathan Stempel helps Sebastian R. Saldivar ’15 prepare for an interview in the SOCH. For the last few weeks, Saldivar has met Lt. Stempel at the SOCH offices to study physics and calculus, along with less commonplace subjects like the neutron cycle and reactor structure. While some ROTC cadets and midshipmen are making use of the SOCH, the study space represents only the first in a series of expansions and changes that they’d like to see. But for many of those changes to be feasible, the Harvard program would have to host significantly larger numbers of cadets. “It’s kind of a Catch-22,” Saldivar says. “If [there were more resources] at Harvard, the numbers would probably increase, because people could try it.” But, without more ROTC cadets and midshipmen, the military and Harvard won’t offer more resources. Ideally, says Saldivar and other members of the program, Harvard would be home to enough cadets and midshipmen to support a unit based at Harvard, as it did in the days before Vietnam and the firestorm of protests that prompted the program’s ousting. Daniel T. Fisher, co-director of the HVO, agrees that it would be “truly fantastic” to create an ROTC unit centered at Harvard and raise the current status of the program. To that end, he and his organization have begun lobbying the administration and are preparing a “white paper” that will include a list of recommendations for ways to improve Harvard’s approach to ROTC. First and foremost, Fisher would like to see Harvard admissions take ROTC involvement or a student’s ROTC scholarship into stronger consideration when evaluating them as candidates. Sally C. Donahue, director of financial aid and a member of the College’s admissions committee, says that, though ROTC involvement is a strong feature on a student’s application, coordinating Harvard acceptances with ROTC admissions can be logistically challenging. At the time when many students apply to Harvard, ROTC decisions and scholarship awards have not yet been released. Sophia D. Chua-Rubenfeld '15 says that her comments represent only herself, not the views of the military. According to McDonough, who deals with recruiting and scholarships firsthand and stresses the “excellent working relationship” between the MIT ROTC and the Harvard Admissions offices, it’s also partially a numbers game. A couple of hundred qualified students might apply to Harvard and the ROTC unit based at MIT, but because of Harvard’s stringent admissions policies, only one or two might actually be able to make use of the scholarship. McDonough and other commanders at the unit may submit letters of recommendation or other materials about hopeful Harvard cadets to the Admissions Office, which may be factored into Harvard’s decision. Another way to get around the “Catch-22” that Saldivar describes, say supporters of the program, is to improve ROTC for cadets already on campus through a variety of means. A key change, says Fisher, would be offering course credit for more of the army and naval science classes cadets and midshipmen must take to commission—anywhere from six to nine additional classes, depending on the branch, on top of their Harvard workload. While Fisher and others acknowledge that some ROTC courses aren’t necessarily on par academically with Harvard classes, he suggests a compromise that would allow some expanded versions of ROTC courses to count for Harvard credit, so that cadets’ transcripts would reflect the extra academic hours they’ve put into the program. 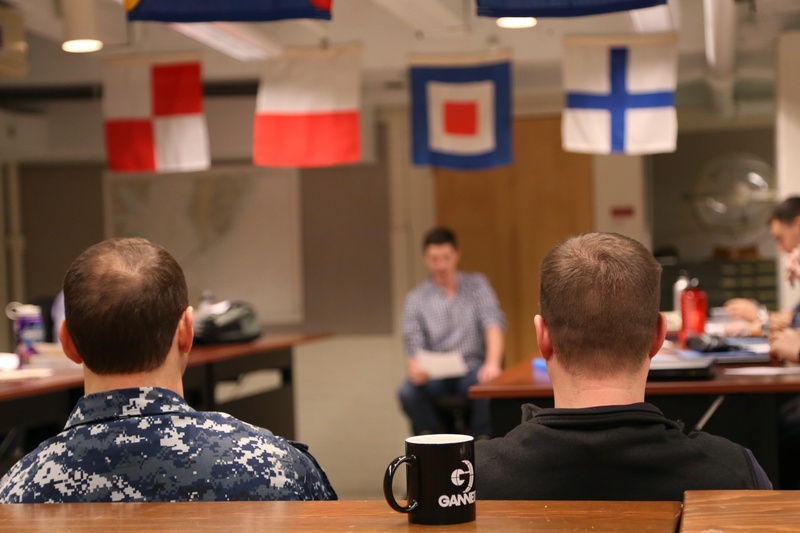 ROTC midshipmen and Marine options give presentations during a naval history class at MIT. Students in Naval ROTC usually take a course on military science each semester. For his part, Dean of Undergraduate Education Jay M. Harris says that the College almost exclusively gives credit to liberal arts classes represented by the Faculty of Arts and Sciences departments, adding that even most professional school courses cannot be taken for credit. Still, Harris says, if the courses were shown to be up to Harvard’s standards, there’s potential they could be taken for credit. “If the case can be made that [ROTC courses] are consistent with the liberal arts focus of the college, of course,” he adds. Another vital change, says Fisher, would be allowing the HVO to pay for cadets’ room and board, which is not automatically covered by their ROTC scholarships and, depending on their family’s financial situation, Harvard financial aid. Donahue says there’s no reason the HVO wouldn’t be able to provide students with money for room and board, as long as the aid doesn’t come in the form of a Harvard grant, which can only be awarded on the basis of financial need and not merit or participation in programs like ROTC. 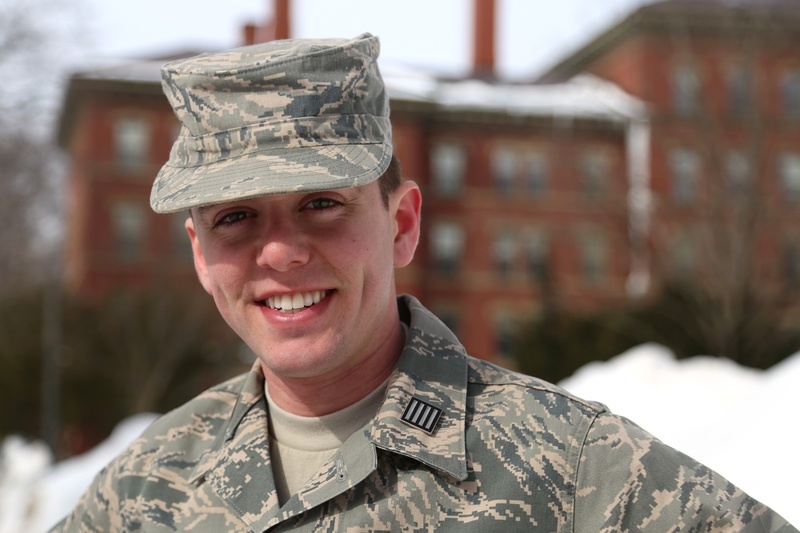 Charley M. Falletta ’16 plans to continue efforts to expand Harvard ROTC. Last Thursday, on Feb. 19, Falletta and two other ROTC students, Mike P. Murray ’17 and Luke I. Pumiglia ’17, climbed the gray steps to University Hall—the same steps that once hosted the violent protests of the 1960s. This time, they met with Khurana. For the most part, Falletta says that the meeting was a positive one; she feels better about program’s relationship with the Harvard administration. Long troubled by issues of access, Falletta finally feels like she has an administrative contact in Associate Dean of the College Rouse. 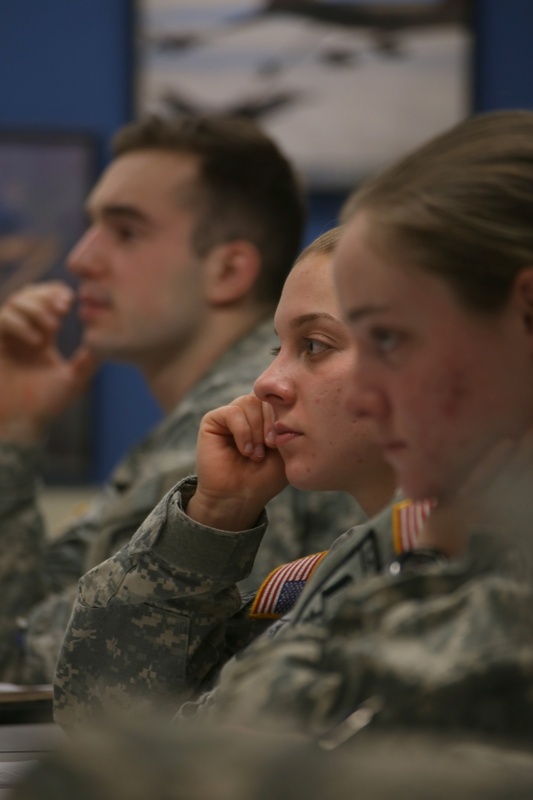 Charley M. Falletta ’16 listens during Army ROTC’s weekly leadership lab on Wednesday, Feb. 18. Still, Falletta stresses that obstacles remain. She says that Khurana’s hands are largely tied for the ROTC community’s trifecta of goals—course credit, funded room and board, and support from Admissions—and that the power to effect many of these changes lie not in the hands of the College administration, but with FAS and the Admissions Office. (The Faculty is responsible for voting on proposals to change College policy, such as those concerning course credit.) Falletta says she’s less upbeat about how ROTC might go over with the University’s largest Faculty. Not that that means she’ll quit—that wouldn’t be like her, or her years of training. “We will exhaust our options,” she says. —Staff writer Emma K. Talkoff can be reached at emmatalkoff@college.harvard.edu. —Staff photographer Madeline R. Lear can be reached at madeline.lear@thecrimson.com. Follow her on Twitter @madelinerlear. Daniel G. Punt '99, a Navy midshipman, has listened to the Undergraduate Council debate to bring ROTC back to campus. While President Faust was quick to reach out to those at West Point, she has been frustratingly slow to respond to the cadets and midshipmen on her own campus.